Agreement is rare in the U.S. Congress in recent years, but comity may soon be restored if but only on one crucial bill. It was on November 14 that the House of Representatives voted 252 to 161 to approve legislation directing the federal government to go ahead with the controversial TransCanada Keystone XL petroleum pipeline that would connect Canadian diluted bitumen oil producers with port facilities and refineries on the Gulf of Mexico. At stake is not only the completion of a project that has been stymied throughout the Obama administration, much to the consternation of Republicans and the oil industry, but that will have an impact on the partisan makeup of the U.S. Senate. There is little hope that that a bill will pass the current Senate on November 18, where a Democratic party majority holds. By some counts, that the bill would not attract 60 votes. A possibility of a Republican filibuster hangs in the air. And President Barack Obama has already signaled that a veto is likely if the bill does pass the Senate. Complicating matters for Democrats is that Senator Mary Landrieu is currently facing a runoff election in her bid to stay in the Senate. Republican Rep. Bill Cassidy will face the incumbent again in the December 6 runoff. With Landrieu’s seat now in jeopardy, Senate Democrats appear to have changed their minds about the Keystone project, which is crucial to Landrieu’s tenure. House Democrats appear miffed about the apparent change of heart among their senatorial colleagues. Among the House Democrats disgruntled by fellow Democrats in the Senate playing games is Rep. Raúl Grijalva of Arizona. According to The Hill, Grijalva said after the November 14 vote, “There is a level of disappointment that this is about political one-upmanship.” He added, “They are hijacking the process.” Some House Democrats fear that the decision by the Senate’s Democratic Party leadership to allow the forthcoming vote on the pipeline will be a wasted effort in trying to salvage Landrieu’s seat. It is not only Washington politicians who are incensed about the pipeline vote. Following the House authorization of the project, the leader of the Sioux nation considers the authorization of the pipeline as an “act of war.” Rosebud Sioux Tribal President Cyril ‘Whitey’ L. Scott said on November 14, that his nation (a.k.a. Sicangu Lakota Oyate) has not been properly consulted about the pipeline that would transect tribal land. So far, said Scott in a statement, tribal concerns have not been adequately address by the Department of Interior and the Department of State. “The House has now signed our death warrants and the death warrants of our children and grandchildren,” Scott said. “We are outraged at the lack of intergovernmental cooperation. We are a sovereign nation and we are not being treated as such. We will close our reservation borders to Keystone XL. 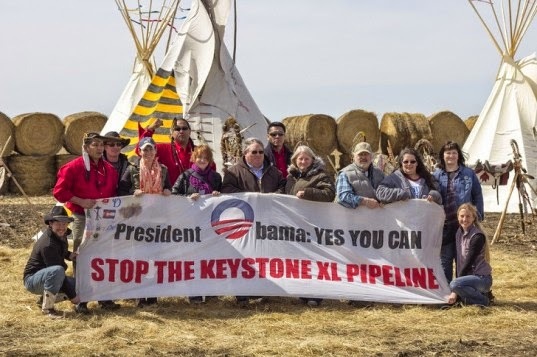 Authorizing Keystone XL is an act of war against our people,” he said. Scott’s statement underscored resolutions adopted in February of this year by the Rosebud Sioux Tribe and other members of the Great Sioux Nation expressing opposition to Keystone. “The Lakota people have always been stewards of this land,” Scott said. “We feel it is imperative that we provide safe and responsible alternative energy resources not only to tribal members but to non-tribal members as well. We need to stop focusing and investing in risky fossil fuel projects like TransCanada’s Keystone XL pipeline. We need to start remembering that the earth is our mother and stop polluting her and start taking steps to preserve the land, water, and our grandchildren’s future.” The proposed route of the pipeline crosses directly through Great Sioux Nation (Oceti Sakowin) Treaty lands as defined by both the 1851 and 1868 Fort Laramie Treaties, according to the tribe, and is within the current exterior boundaries of the Rosebud Sioux Reservation and Cheyenne River Sioux Reservation. “We’re trying to devise plans to protect the people from these things like KXL,” said Scott. In May 2014, members of the Rosebud Sioux Tribe hosted a tribal spirit camp near Ideal, South Dakota, in an expression of solidarity in opposition to the pipeline. Members of the Shield the People Project, and the Ideal, Ihanktowan, and Rosebud tribal communities erected tipis, and a fortified wall of 1,500 lb. grass bales to surround the camp. “We’re trying to devise plans to protect the people from these things like KXL,” stated Scott at the time. “We’ve made an oath to protect you and we’re going to do that.” They demanded that President Obama veto the project. Tribal representatives from as far away as Nebraska and Montana also participated. Representatives of the so-called Cowboy & Indian Alliance in Nebraska also attended. Members of the Indigenous Environmental Network, Bold Nebraska and the Cowboy & Indian Alliance were in evidence later at a protest held in Nebraska in September. An associated concert featured perennial protest artists Neil Young and Willie Nelson. Ranchers and farmers in the states transected by the pipeline have expressed worries about the potential environmental hazards posed by pipeline leaks, joining environmentalists and conservationists. An example of the hazard occurred in Michigan in 2010 when some 1 million gallons of tar sand oil (the commodity that will flow through Keystone) was spilled by an Enbridge company pipeline into the Kalamazoo River. That river flows into Lake Michigan. The clean up cost almost $800 million, plus the still untold damage to the environment, in that case. Opponents of the pipeline point out that the proposed route of the project would pass over the massive Ogallala Aquifer where the water table lies close to the surface. An oil leak could poison the water supply over an area of the Midwest where fully one quarter of the nation's most productive farmland is located.